Zebra GK420t - Direct Thermal/Thermal Transfer printing, 203 dpi, 4" print width, Serial, Parallel and USB interfaces. Includes US power cord and USB cable. Replacing an old version of the same printer. Very easy to install and use. 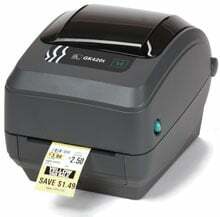 The print cartridges cost twice what the older printer cost for the same result. Simple to connect simple to use nothing complicated. We are barcoding our warehouse. It was very easy to install and prints very fast. Barcodes are easy to read and format. The labels sometime roll around the inside roller if you rip them off too fast and they don't leave a clean edge after the tear. We use these units in our tissue culture and plant growth facilities. They have proven reliable and stand up, even under the dirty, harsh conditions of the greenhouse potting room. it works awesome & easy to to use. i bought last year & it works good . coustomer service is awesome. Excellent product. I have bought 4 over the past year for our barcoding needs within our manufacturing plant. Never went down, minimal maintenance. Great buy! The Zebra GK42-102510-000 is also known as ZEB-GK42-102510-000	or GK42102510000	.